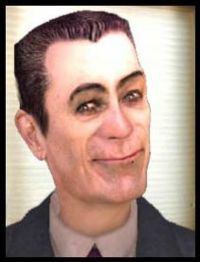 G-Man is a character from the popular Valve game Half-Life. He is the star of a fad that involves him dancing around and "having a wonderful time" in various settings created with Garry's Mod. These creations are typically and appropriately set to the song "Livin' in the Sunlight, Lovin' in the Moonlight" by Tiny Tim. Almost all G-Man YTMND's take place on the map cs_office form Counter-Strike: Source. Infatuated with facts? Wikipedia has an article about the G-Man. Go learn something. This page was last modified on December 18, 2012, at 18:01.